The crisis in access to higher education, and a strategy for moving beyond elite handouts for the lucky few. But that synthesis of excellence and access is rapidly coming undone—even as U.S.-based universities continue to rank at the top of lists of relative institutional excellence, and the country is admired across the world for its historic primacy in offering higher education to the many, not just the few. Even as the advent of the Information Revolution and the postindustrial economy has intensified Americans’ faith that advanced degrees and advanced research are central to social opportunity and economic vitality, the United States no longer leads the world in the attainment of college degrees. Meanwhile, growing imbalances in popular access to and wider resource gaps among institutions of higher learning threaten to turn higher education from a great equalizer of opportunity to a force that deepens inequality. Alarmed leaders of super-rich colleges parried by skimming a bit of endowment-return cream to lower net tuition and expenses for middle- and upper-middle-class students, as well as for lower-income enrollees. While some commentators praised this largess, op-ed critics pointed out that the options open to the Harvards, Princetons, Yales, and Stanfords of the world are light years from the tough fiscal trade-os faced by the modestly endowed universities and tax-starved community colleges that the vast majority of Americans attend. “Bravo for Yale and Harvard, but what about the rest?” asked University of California, Berkeley chancellor Robert J. Birgeneau in USA Today. The aid enhancements and ensuing debate did little to expand college access, but did dramatize why fundamental solutions must involve more and better-directed resources from the federal government, not just regulatory gimmicks that induce charity from the richest universities. In America, private benefactors, churches, and state governments have promoted a raucously decentralized, competitive hodgepodge of thousands of colleges and universities, collectively offering many more citizens routes into all kinds of vocations than do the elite universities in Europe. At the same time, the federal government has long used public expenditures, regulations, and tax breaks to promote educational access and institution-building. Especially after the Civil War, when the land-grant university system (subsidized by the Morrill Act of 1862) spread higher education across the country and into practical areas of knowledge, and again during the golden era following World War II, when the GI Bill expanded student access and science grants fostered widespread research capacities, Washington played a pivotal role in shaping a capacious and inclusive system of higher education. But that national role has shifted since the 1980s, contributing—along with private and state-level choices—to diminished access and institutional disparities. The time has come to redirect federal efforts: to focus on expanded grants and simplified loans for low- and middle-income college students, and to build the capacities of the public community colleges and universities to open doors of opportunity for the many, rather than catering to the wealthiest and luckiest few. Before World War II, a broad network of public and private colleges existed in the United States, but the Depression hurt both, and higher education remained an elite affair into the 1940s. Then, suddenly, the doors to higher education swung wide. The population grew by 54 percent between 1945 and 1975 (from about 140 million to 215.5 million), yet the number of students enrolled in higher education rose more than sixfold (from about 1.7 million to about 11.2 million), and the number of earned degrees grew more than tenfold (from 157,349 to 1,665,553). Expansion of state universities led the way, but universities grew across the board. Millions of young men from modest backgrounds were able to complete college on the GI Bill. Advances for other groups, including women and minorities, followed. Since the 1970s, however, enrollment expansion has slowed and social opportunity has constricted, despite the heightened value of a college degree. In 1979, an American worker who had completed a college degree earned about 1.4 times the income of a worker who hadn’t—and that premium grew to 1.75 by the end of the century, where it remains today. Families obviously have a greater incentive to send offspring to college, and the proportion of 18- to 24-year-olds enrolled has indeed grown by more than a third since the late 1970s. Still, the overall enrollment increase has lagged the rising wage differential, and the response has been especially sluggish lower down the income ladder. Socioeconomic gaps in enrollment have expanded, and so have racial gaps between whites and blacks (even though blacks have become increasingly likely to graduate from high school). In 1970, 6.2 percent of the U.S. population in the bottom income quartile had completed a baccalaureate degree by age 24—but that percentage actually declined slightly, to 6 percent, by the year 2000. Meanwhile, lower-middle-income young people from the second-lowest income quartile improved their college completion rates only slightly, from 10.9 percent to 12.7 percent. But completion percentages for young people in the third quartile—solidly middle-class families—rose markedly, from 14.9 percent to 26.8 percent in 2000. 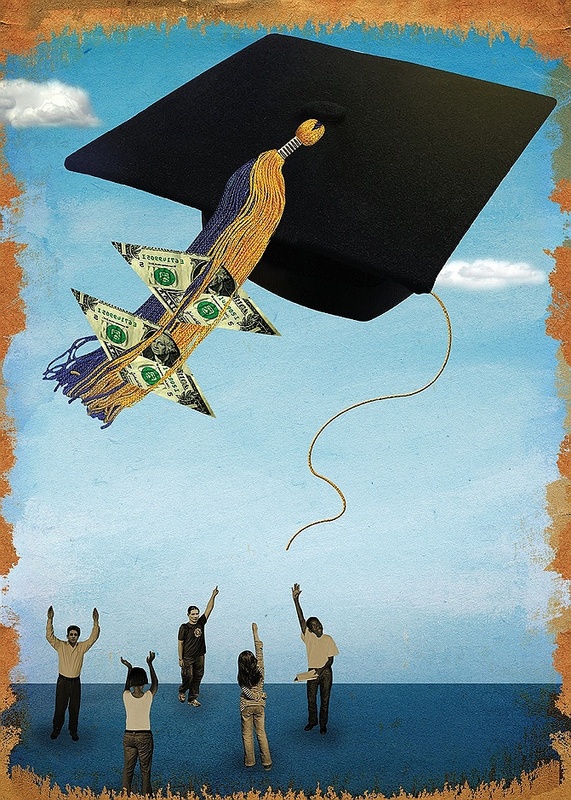 And for the most privileged, those from the top quarter of the income distribution, college completion rates rose from 40.2 percent to 51.3 percent. Compared to the mid twentieth century, higher education is now increasingly exacerbating socioeconomic inequality in the United States. Its success at fostering upward mobility has diminished sharply. Many factors combine to explain this deteriorating access to college for less-privileged Americans: problems in the K-12 educational system, the effects of post-1965 immigration, and the impact of changing family structures and practices. At the same time, public grants and subsidies have failed to keep up with rising costs, and the process of obtaining aid has become harder. From the GI Bill through enactment in 1973 of Pell Grants (voucher grants to help low-income students), federal aid policies stressed grants to make college predictably affordable. Thereafter, the bulk of federal programs shifted toward student loans, with the government providing subsidies to encourage banks to lend—and more recently, toward tax credits as well. Typical indebtedness for college graduates who take loans now averages about $20,000—a daunting amount for young people from less-privileged backgrounds. Moreover, guaranteed bank loans and nonrefundable tax credits disproportionately help subsidize college costs for privileged families, while Pell Grants for low-income students have been allowed to deteriorate in real value. In 1975, maximum grants covered 84 percent of the cost of a public education, but by 2006 the subsidy had shrunk to less than a third of the cost. According to education experts Ted Mitchell and Jonathan Schorr, 38 percent of students enrolled in four-year public institutions in 1995 came from Pell Grant-eligible low-income families, but that percentage dropped to 28 percent in 2003. Some states have grant programs of their own, but in recent years much of that aid has shifted toward “merit scholarships,” which are likely to be won by middle- and upper-middle-class students, thanks to better educational resources and access to college counseling. Low-income families, on the other hand, rarely know up front—when their children must apply to college—how much help they will qualify for, especially the total they might expect from state, national, and private sources combined. As these trends have played out, according to a 2007 Organization for Economic Cooperation and Development report, “the United States has moved from first place for higher-education attainment levels among 55-to-64-year-olds to fourth place among 35-to-44-year-olds and tenth place among 25-to-34-year olds.” In the youngest age cohort, Belgium, Canada, Denmark, France, Ireland, Japan, South Korea, Norway, and Spain have all overtaken us—a startling development for the one-time world leader in access to higher education and a worrisome development in an ever-more-competitive world economy. Given the fiscal obstacles in Washington, some in Congress are trying to address cost increases in higher education with cheap regulatory gimmicks, such as mandated payouts from the richest college endowments or a “watch list” ranking colleges by their rate of annual tuition increases. But such lists can hurt poorer colleges that must boost their top tuition rates (easily paid by the wealthiest) to survive or improve. As a result, lower prices at the Harvards and Stanfords of the world can, ironically, end up making things worse for most U.S. students and their families as the effects reverberate through the entire system of competing colleges and universities. For the 2007-08 admissions season, a few super-rich universities cut prices across the board—but that benefited the well-to-do as well. These same universities brag about their promises of a free ride to families making under $40,000 to $60,000, but very few students from low-income families gain admission to the top colleges. The only way highly privileged institutions could even slightly widen the tiny dent they make in higher-educational disparities would be to double or triple the size of their entering classes—with growing proportions of slots set aside for less-privileged students to whom they offer substantial remedial and support services along with free tuition. With a few exceptions—such as Amherst College in Massachusetts, a leader in adding and supporting low-income students, and Berea College in Kentucky, which admits only low-income students for a no-frills, debt-free education—the best-endowed institutions show little inclination to use their wealth in such a way. Instead, they deploy burgeoning resources to enhance research programs, poach top faculty, and subsidize aid and fabulous services for the small numbers lucky enough to gain admission. But a policy focus such as Senator Grassley’s on high-priced, high-prestige institutions obscures the reality of modern higher education. Eighty percent of college students attend public institutions—and nearly half of them are enrolled in two-year community colleges. State and local subsidies to such institutions have shrunk in recent years (even as the demand for admission to them has grown), and inevitably the public institutions have had to raise their tuitions. This makes access to them, too, increasingly costly for average and less-privileged families. Faced now with greater competitive pressure as Harvard and the other elite universities offer lower sticker prices to middle-class kids, state universities will have an even harder time attracting top high-school seniors, and will face sharper trade-os between giving merit aid and need-based aid, and between giving student aid in general and supporting institutional facilities. In short, regulatory gimmicks and Ivy League noblesse oblige worsen the distributional dynamics: what is good for Harvard is not automatically good for U.S. higher education as a whole. In an ever-intensifying rat race, the wealthiest half-dozen private universities are squeezing the less-endowed privates, and all the endowed private institutions are, in turn, putting pressure on little-endowed colleges and public universities. This picture—more and more resources (dollars, top students, star faculty) flowing toward the top of the top—mirrors the trend of class inequality in the United States since the 1970s, and further widens class inequalities overall. The focus of policy, in other words, should be on broadening opportunity for the vast majority of potential college-goers in the middle and at the bottom. That means making college more affordable for less-privileged families and enhancing incentives and capacities for community colleges, public universities, and private colleges of lesser means to recruit and educate students from families of modest means, including families whose breadwinners have not attended college. The public mood about government is shifting, as millions of families realize they need its support to cope with rising costs and prepare their children for the future. Legislators can no longer ignore issues of access and excellence in higher education because opportunity, citizenship, and economic competitiveness are all affected by the choices the federal government makes about this critical sector. The obvious top priority has to be further boosting outright grants for low- and lower-middle-income students. Pell Grant levels rose significantly in 2007, but increasing the enrollment and graduation rates of less advantaged students will require additional growth beyond the “keeping up with inflation” that Barack Obama promised as a candidate. Other aspects of federal assistance need work, too. As Obama suggests with his “American Opportunity Tax Credit,” such help must take the form of “refundable” credits (that is, funds that go to families even if they do not owe a lot in income taxes). That is the only way such payments could actually expand access for lower-income students. Furthermore, federal loan policy should take advantage of the current banking crisis, perhaps by using a higher proportion of public funds to make loans directly to students. Another possibility is to encourage tougher competition among subsidized private bank lenders, encouraging them to lower costs to students as a condition of enjoying federal guarantees. Either way, reducing the amount the federal government diverts to subsidizing banks can free resources for increasing access to college. Next, it must become easier for families to understand and predict college aid of all sorts. For low- to moderate-income students, the apparent “sticker price” of college tuition combined with the overwhelming complexity of federal policies and the timing of colleges’ financial-aid decisions (now coming after students gain admission) may preemptively discourage many from even applying. Some progress was made in 2007, but policymakers should further streamline the process so potential students can base their decisions on a more realistic understanding of how much aid will be available to them. Information about potential financial-aid packages could be given to families early in students’ high-school years. Loan-repayment policies also need careful attention, because of the burdens and distributive inequities they create. Current practices impose severe penalties on former college borrowers who fall into financial trouble, often making them worse o than if they had never attended college in the first place. If the repayment system could be made somewhat redistributive, that could help make federally guaranteed loans progressive, rather than regressive in impact. Why not make student loans automatically repayable through the annual tax-return system? Repayments universally set at a fixed percentage of incomes over a period of years after college would ensure neutrality about career choices; eventually, this approach might allow the collection of slightly higher repayments (perhaps up to 110 percent) from the highest earners. Their good fortune would bolster the system’s capacity to make loans to others. A renovated federal approach to higher education must also find ways to encourage states to invest in public universities and colleges. In recent decades, state support for public universities has both declined dramatically and increasingly been diverted toward better-o students. Even though state budgets have been burdened by growing entitlement obligations (most notably for Medicaid and K-12 education), appropriate shifts toward higher education could be spurred by federal supplements to financial-aid allocations for low-income students. Or the federal government could give incremental general-purpose support to higher-education institutions that increase enrollment and graduation rates for Pell Grant students. Some private colleges might benefit in this scheme, but most of the federal reward would go to the public institutions that enroll the bulk of needy students. The nation’s 1,045 community colleges deserve particular attention and support. Funded by states and localities, these two-year institutions attract large numbers of less-privileged students and funnel graduates with basic college skills into local workforces. Making community colleges more affordable, and increasing their capacity to link to local employers, or to better counsel students able to go further in college, can arguably do more for open access than any other sort of institutional support. Academic institutions must get involved as well. Community-college students often find that few of their credits transfer to four-year institutions, a situation that could be remedied by better cooperation. The Jack Kent Cooke Foundation, for example, has recently created an exemplary program to support Amherst College and seven other highly selective institutions that have partnered with nearby community colleges to identify promising potential transfers and help them make the transition to four-year college. Both the federal and state governments need to learn from such efforts. Ultimately, these linkages should reach down to the high schools that enroll students from families lacking college experience, to provide trained counselors to lift student aspirations, channel their efforts in realistic ways, and make connections to colleges seeking to broaden admissions. Our country can’t compete without broad access to higher education. Harvard, Princeton, and Stanford may dominate the headlines, but public institutions are at the front lines of this struggle, and we must foster their efforts to identify and direct talent for the future. The competitiveness of our economy and the vibrancy of our democracy both depend on rejuvenating the marriage of excellence and opportunity that has characterized America—and U.S. higher education—at their best. Now is the time to reopen the doors to college for the many, not just the lucky few. Theda Skocpol is Victor S. Thomas professor of government and sociology at Harvard and past dean of the Graduate School of Arts and Sciences. Suzanne Mettler is Clinton Rossiter professor of American institutions at Cornell. This essay is adapted and excerpted from their article “Back to School,” which appeared in the Fall 2008 issue of Democracy: A Journal of Ideas (www.democracyjournal.org/article.php?ID=6639 ).